The Workshop to disseminate the environmental science field study was successfully held with 140 participants. Following international and local experts' presentations, selected students at the Department of Environmental Science of the Royal University of Phnom Penh presented their own research results. Please click here for more details. UNU-MANAGE has received Mitsui Environmental Fund to support field research studies at the Department of Environmental Studies of the Royal University of Phnom Penh. The fund will support a two-year project promoting multi-sector involvement for seeking sustainable operation of the official educational program. 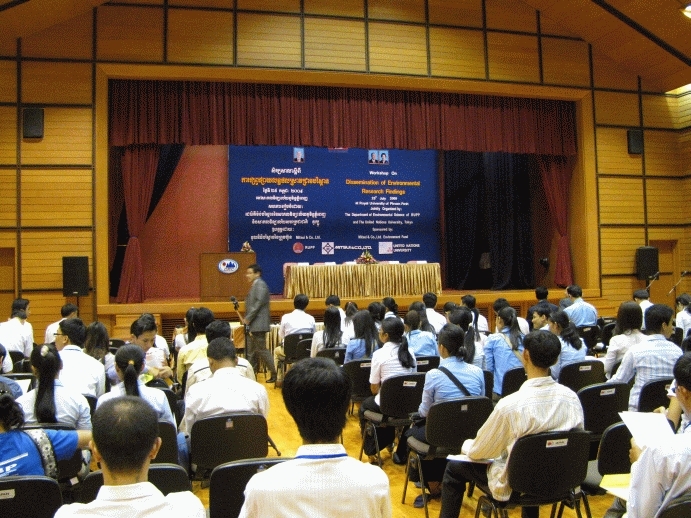 A kick-off workshop will be held in July in Phnom Penh. 2008.11.25 • UNU Rector Konrad Osterwalder and Shimadzu President Shigehiko Hattori signed a historic agreement today to establish the 5th phase of the project "Environmental Monitoring and Governance in the Asian Coastal Hydrosphere". The signing ceremony marks a new phase in pollution monitoring in Asia. 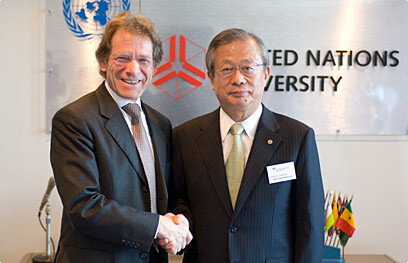 The project is one of UNU’s pioneering public and private-sector partnership projects. Established 12 years ago, its aim is to strengthen environmental research and education capacities in Asian developing countries and, over the longer-term, create the scientific infrastructure necessary for environmental governance and pollution-monitoring in the region. 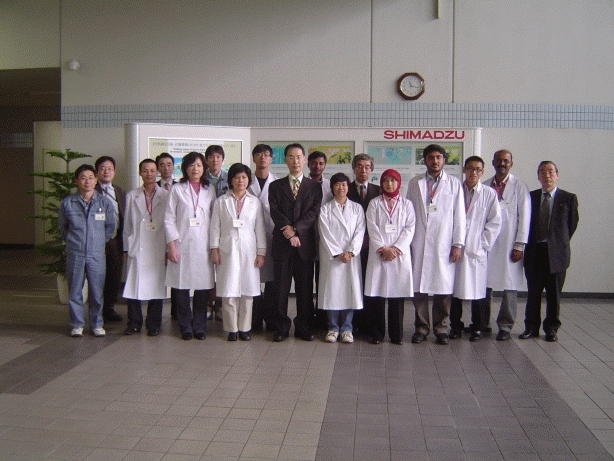 With generous support from Shimadzu Corporation, the 5th phase (2008–2011) will target the monitoring of polychlorinated biphenyls (PCBs) in the environment. Classified as persistent organic pollutants (POPs) that are regulated under the Stockholm Convention, PCBs are toxic to human and ecological health. For more information on the UNU-Shimadzu project and other UNU initiatives on environmental monitoring, visit the UNU Environment and Sustainable Development website. Three UNU-private partnership projects are introduced as examples of success in the brochure. The full brochure is available from here (PDF, 127KB). UNU Training on POPs analysis in Squid (17-19 March 2008, Hadano, Kanagawa, Japan) was completed. The participating trainees selected by the project partners have learned POPs analysis in squid liver samples. Prof. Yuzuru Ikeda (University of the Ryukyus) gave a lecture on the ecology and intelligent behavior of squids. Please click here for more details. National Level Training Workshop On Gas Chromatography Mass Spectrometry (GC-MS) in Environmental Analysis (January 22nd – 26th, 2008, Tiruchirappalli, India) was hosted by Bharathidasan University, the Indian project partner. 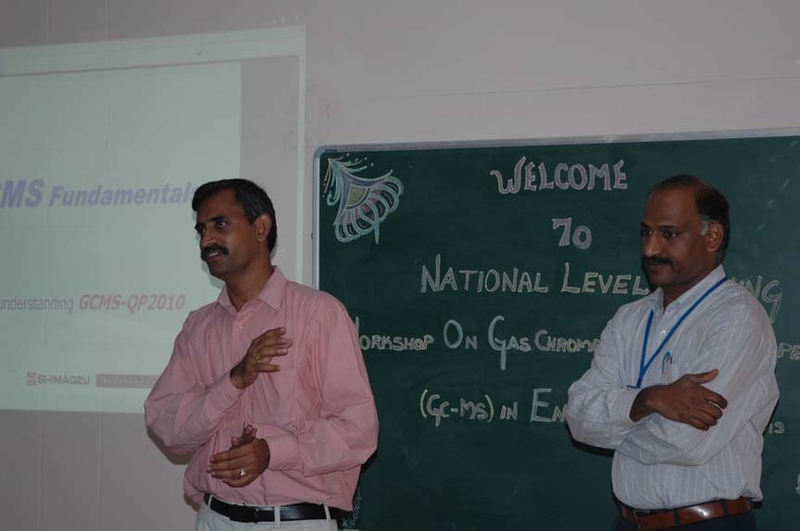 Dr. Babu Rajendran (left) speaks at the workshop with his colleague. A new issue of Asia Monitor is now available with its new focus on POPs in Asia. 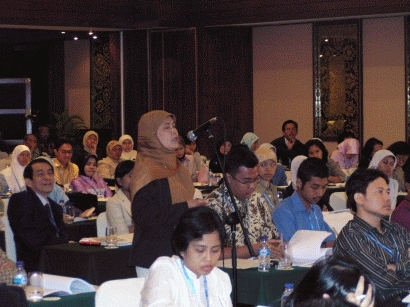 UNU Symposium on POPs: Global Transport, Best Environmental Practice, and Risk Perception was co-organized with the Indonesian Ministry of Environment on 14 November, 2007. The 27th International Symposium on Halogenated Persistent Organic Pollutants (Dioxin 2007) was held between 2-7 September 2007, in Tokyo. UNU presented its project results at the Environmental Asia session. The third meeting of the Conference of the Parties (COP3) of the Stockholm Convention took place from the April 30th through May 5th in Dakar, Senegal. In relation to the Financial Resources Agenda, UNU took the floor to briefly introduce their successful private sector partnership program. This untapped and yet potential financial resources has supported the UNU’s project on POPs monitoring and governance since 1996 and could serve as a model for other partnerships in the future. © 2009 UNU. All rights reserved.